Alfreton Town were knocked out of this season's Emirates FA Cup at the First Round stage as League One Fleetwood Town produced a clinical and professional display at the Impact Arena on Sunday. Billy Heath had a few selection issues with Sam Hird, Reece Styche, David Lynch and James Clifton all unavailable. Martin Riley, Danny Clarke and Josh Clackstone all started. After a wonderfully observed minutes silence on Remembrance Day, the Reds started the game well with Curtis Bateson causing problems down the left wing, the Cod Army looked dangerous themselves on the counter attack with Ash Hunter being tackled well by Bobby Johnson following a Reds long throw. The League One side, as expected, dominated the ball in the early stages but Alfreton held their own and remained compact and organised. We were looking to utilise neat interchanges as Richard Peniket and Jordan Sinnott combined, the latter just ran the ball out on the left wing for a goal kick. But after 13 minutes, Fleetwood struck with their first attack of the game. A cross from the right found Paddy Madden who hooked a shot into the far corner inside the box to give the visiors the lead. Seven minutes later it was two, Fleetwood countered with a brilliant pass to release Hunter on the left and he showed excellent pace and finished into the far corner past Sam Ramsbottom. Sam denied Holt adding to the Cod Army's tally with a wonderful close range save in the box. The two quick fire goals had taken the sting out of the Reds bite and the contest seemed to slow with the visitors having a lead to protect and in turn the difficult job the Reds faced mid-way through the first half. Nathan Hotte tried the acrobatic with an over-head kick in the box but Cairns held well, Luke Shiels headed an effort over but the offside flag went up before Josh Wilde's cross went out at the far post as Alfreton continued to muster creativity. Sam was alert again at the other end to save another effort at the far post from close range before the Reds were so unlucky not to pull one back before the break. A short corner from Bobby Johnson found Jordan Sinnott whose shot was cleared off the line at the near post. The second half saw early defending for us to do as we cleared several corners, Bateson was found on the left in the box but his shot hit the side netting. The Reds continued to probe but looked apprehensive at times to unload a strike inside and outside the box. With 59 minutes gone, Fleetwood were awarded a penalty, Hunter was caught from behind in the box and Madden stepped up again to fire high into the middle of the net to add a third. 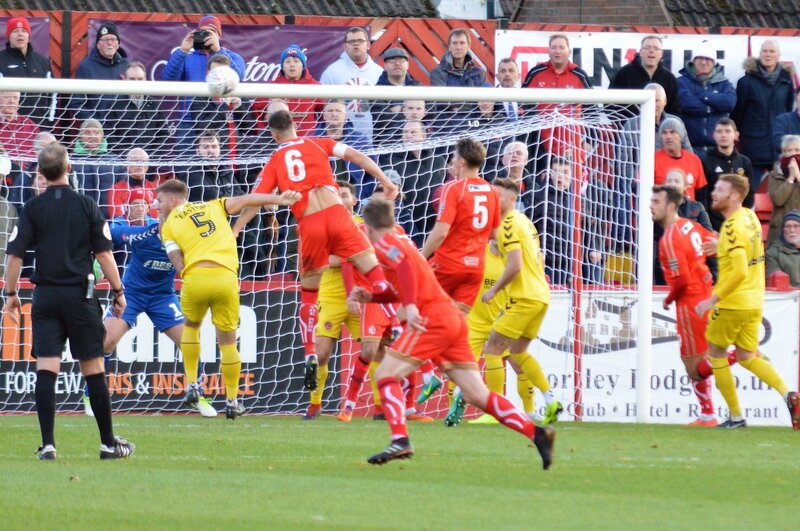 Cairns denied Peniket from close range which was a huge opening for the Reds, Callum Chettle's energy gave Alfreton's bite back and the second half soon changed in momentum. Bobby Johnson fired a free kick over the bar, before Sinnott pulled a goal back for us on 69 minutes and gave the Reds a deserved goal. Cairns couldn't keep out despite getting a big hand on it from 26 yards out. Cairns denied Peniket again with a great save to his left, Chettle was then denied the rebound after an excellent recovery challenge, Chettle then came close as he fizzed an effort which went just wide of the top corner from the left side of the box. Alfreton should have made it 2-3 on 76 minutes but Cairns denied Chettle's first time effort from five yards out after a good cross from Peniket. However late on it was Fleetwood who would complete the scoring as Garner glanced a right wing cross into the far corner past Ramsbottom to make the score-line harsh on the Reds. Alfreton's second half performance was one to be proud of and despite the score-line, the contest was far closer than it looked with Fleetwood's quality the main difference. With plenty of positives to take against a League One outfit, we look to get league form back on track with the visit of Nuneaton Borough on Saturday, 3pm kick off. ATFCXI: Ramsbottom, Clackstone, Riley, Shiels, Wilde, Johnson, Riley, Bateson (Bacon 87), Hotte, Peniket, Sinnot, Clarke (Chettle 61). Subs not used: Platt, Nicholson, Gowling. Fleetwood XI: Cairns, Coyle (J.Wallace 60), Holt, Eastham, Burns (Garner 65), Bolger, Madden, Hunter (Dempsey 80), R.Wallace, Husband, Sheron. Subs not used: P. Jones (GK), Long, Taylor, Biggins.